Chatting on WhatsApp & BlackBerry Messenger and also Surfing Twitter & Facebook for just #200 per month ? WTF. Yeah, What The F***. Is this how you feel when you read the title of this post ? If you felt that way then you are a cool buddy too because that's exactly what Airtel named this bundle - "WTF" but this time around it doesn't mean what we always associate it with. As far as Airtel is concerned, WTF stands for 'WhatsApp, Twitter and Facebook'. Is that not cool ? I bet you, it is. Keep on reading as I explain what this plan is all about and how to subscribe to the plan. 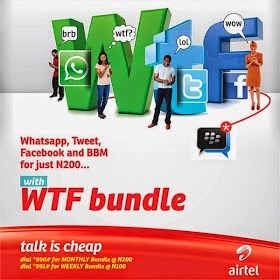 The WTF bundle is the newest data plan from Airtel Nigeria which gives subscribers access to BlackBerry Messenger (BBM), WhatsApp, Twitter and Facebook for just #200 monthly. Even, this plan still gives you access to all the previously mentioned Apps/Sites for #100 weekly but we all have at least little or maybe big Mathematical and Economical Knowledge so we know it's better to subscribe to the #200/month bundle instead of subscribing to #100/week which will result to #400/month after 4 weeks, hope you get the tip ? I trust you **winks**. If you are a Social Network addict, I'm assuring you that this plan was made just for you. Why subscribe to other Airtel full data plan when ALL you do is access these Social Apps + little or no browsing at all ? 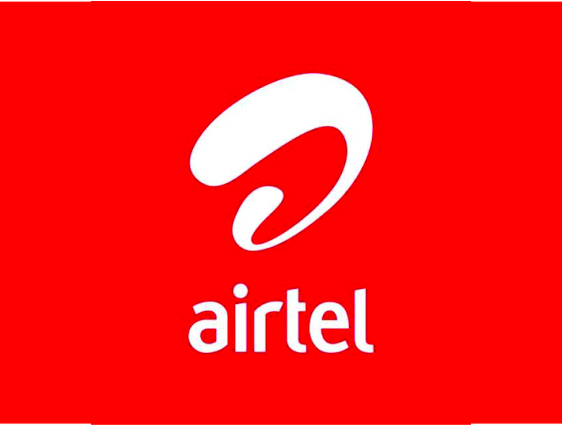 Although, this plan gives you access to just 4 Apps yet it is still very very affordable, but if you are the always-browsing type, then you can go for the Airtel BIS and configure it to work on your Android, iPhone or even on your PC or just stay tuned to StevenBergy.Com.Ng [SBCN] as I bring you the most affordable full data plan which I myself is using today. Now, back to our main discussion, do you think you're the WTF buddy ? Get started by dialing the applicable USSD below. Note: Dial *990*0# to check your WTF Data balance. Do you have any question concerning this data bundle ? I guess this Frequently Asked Questions (FAQs) will help. What do you think about this data plan ? Do you like it ? Are you going to give it a try ? Let us know your thoughts by dropping a comment using the comment box. Have you subscribed to our FREE mailing list ? Kindly do so by clicking here so that you will receive ALL our future posts directly in your mailbox. Also, do you enjoy this post in general ? Why not do everyone of us a favour by sharing this post with your family and friends, using the share buttons below ? It's really helpful. Blessings !!! i want to ask if this WTF bundle can work on blackberry phone? Please what code can I use to opt out of the WTF plan on my mobile.